Does anyone have this setup or are familiar with it? How well does it perform? I have a 72 GT380 with 3-into-3 Higgspeeds. Add two GT750s — one is stock & the other has a Jemco 3-into-1. I’m fine with the GT750 + Jemco 3-into-1. The GT380 with 3-into-3 Higgspeeds is sweet but the sidestand was a PITA to redesign for cornering clearance. So I’m wondering about the pros & cons for my GT550 cafe build. Do you have any pictures I've never seen any 3 into 1's for these bikes. Although in my experience you can't get as much power with 2-1 or 3-1 as you can with a pipe for each cylinder. I've had a lot of experience with snowmobile engines in this matter which is basically the same thing except for bikes have multiple gears and sleds have a type of CVT using 2 clutches and a chaincase. I have built a fair amount of exhausts but have never built 2-1 or 3-1's so it may just be the tuned measurements in that they were made but when I have come across performance built 2-1 or 3-1 exhausts they seemed to excel in low to mid-range power where multiple chambers could make better mid to top-end power. I hope what I said makes sense and isn't just rambling. It makes sense in my head but then i always have a hard time explaining it. Jemco pipes not common in the UK, but I tried Piper 3-1 on my 550K a couple of years ago and other tvan it being very loud, I didn't notice any performance issues. It did just over the ton in the Isle of Man anyway. Biggest adantage is the weight saving. Remember that these bikes are at least 40 years old now, so if you want high performance, realistically you will be disappointed. They'll do about 115mph tops - and thats on a really good day, slight downhill and chin on the filler cap. Your Piper looks a lot different. The three header pipes on the Jemco look like they might be the same length. The Jemco pipe diameter starts increasing further down the exhaust. But I don’t know how that would affect performance. The Piper muffler section looks skinner then the Jemco. I haven’t done a direct comparison but I think my GT750 Jemco 3-into-1 is a good bit quieter than my GT380 with 3-into-3 Higgspeeds. That’s a nice 73 GT550 you have. Do those few small holes in the front brake rotor make much of a difference in rainy England? The disc drillings make a big difference. I don't go out in the wet nowadays, but the holes give more bite, and a bit better cooling too. The old discs were high stainless and HAF very hard!!) And back when they were new, useless in the wet when cold and wet. I have GS1000 calipers on this one viewtopic.php?f=2&t=11247&hilit=earwig&start=30" onclick="window.open(this.href);return false; and they are much better with bigger pads and a 1200 Bandit master cylinder and GS550 discs. I sold the K last year and currently doing a 550J resto. Sold another K a couple of weeks ago and still have another A parts bike which will be sold on 'soon'! No rest for the wicked! Or page 14 here - http://www.kettleclinic.co.uk/kcforum/v ... &start=130 can't find the TT pic for some reason so here's another instead. 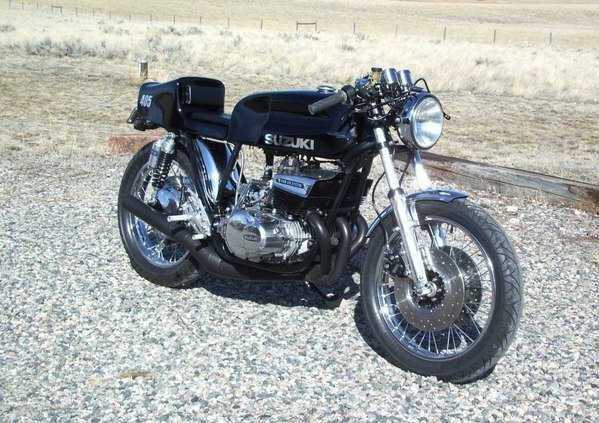 The guys on the Suzuki GS forum have come up with an upgrade that is even better. They have an adapter that mounts a twin piston caliper & use a modern disc. That’s what we did on the GT250 build and will do on the T500 cafe build. I’m with you on the rain. Years ago I always had rain gear & didn’t let a good shower stop me. Now retired, I don’t ride in the rain. If its iffy, I’ll take my modern Triumph. Those are some sweet Suzukis. The gray GT750 has a GS1100 front end. 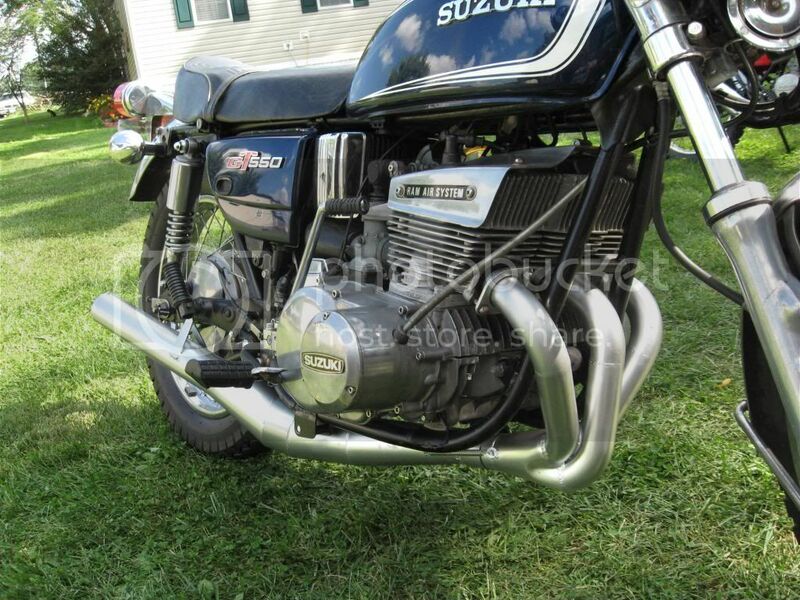 Around 1980-1982 Suzuki started using bushing in the fork tube fork assemblies. They also have top out springs. Its a huge upgrade that gives a much better ride without topping or bottoming out. 3-into-1s look and sound great, and save a ton of weight, and that's it. I had a Piper on my 380 for a year or so (with stock airbox & filter etc), and it stifled the top end: the bike would run fine to 7.000rpm then would simply rev no further. This meant the practical top speed was 80 - 85mph. I believe this was due to the pipe restricting the engine's breathing. On the 550 / 750 triples, this is less of an issue as they don't rev as high anyway, and have more power to spare in the midrange. Thanks for the comment. There's also a GSX1400 just out of camera shot! Craig380, you're right that sounds f** awesome! Almost worth the loss in power lol. I think one of the main problems is the header sections going into the diffuser(first cone) a header that stays the same diameter such as those will give much less performance than a tapered header that gets larger as it approaches the diffuser cone. When I see Titan exhausts that use the stock part of the header and then add on their expansion chamber I cringe there is much power lost and its just a lazy way to build a pipe. However on these 3 into 1's theres really no way to use tapered headers. Also I think your right about there not being enough volume theres only a single expansion chamber yet its about the size of a single. There should be alot more volume in these pipes. Yes, a 3-1 pipe probably can be designed so that it doesn't rob power, like on snowmobiles etc. But when it comes to bikes, the words of Walter Kaaden, the father of the modern 2-stroke come to mind: "You will know when you have the exhaust design which gives the best power, because it will then be impossible to fit it to the machine without it dragging on the ground, getting in the rider's way, or forcing the relocation of other major components ..."
Does Jemco still build and sell a 3-1 for the GT750? Sure sounds good in that video! I believe that Jon Easton of Jemco is still building pipes but I heard somewhere that he's getting older so if you want one get it soon. 2 into 1 pipes are common on sleds and can make good power but they tend to be pretty large. For a triple, there are obviously more pressure waves at play and on a triple they tend to get in the way. Parallel (straight) headers are fine for a reasonable amount of power. Jemco uses them on all their pipes. The Spec11 pipes on my RZ have straight headers and they work really well. To fit tapered headers on a 3 into 1 is possible but keeping lengths the same is a logistical issue. A bigger issue is the change in area across the collector. That transition and the angles after the transition are really important. 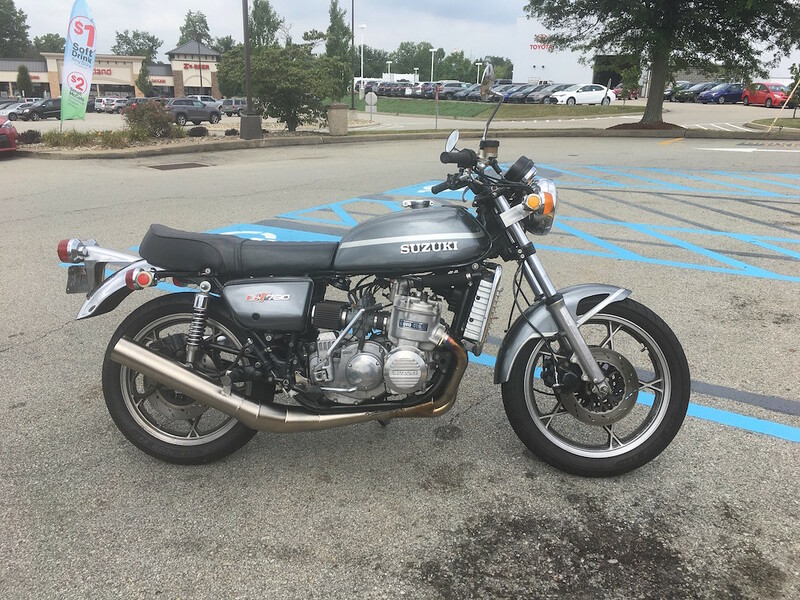 Just as a single data point, I had a GT750 that I ran with stock heavy pipes and a really light small volume 3 into 1. On the street, the 3 into 1 felt much stronger and at speed it was hard to tell from stock. On the dyno, that was found to be less than the whole story, but that's how it felt. The weight difference is significant, so if we say 7 pounds = 1hp, a weight drop of say 35 pounds is equivalent to an extra 5 HP. That makes a difference.